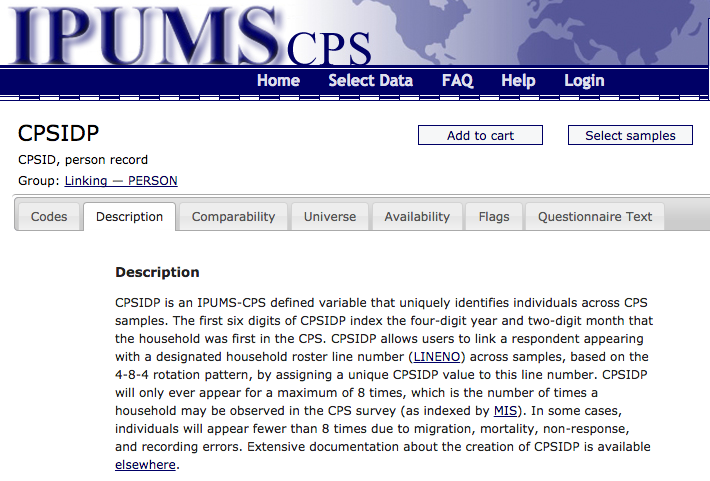 IPUMS CPS has added a new variable to unlock longitudinal information in CPS data called CPSIDP. The identifier, the result of a major initiative from the Minnesota Population Center, uniquely identifies individuals who are in the CPS and is assigned to the individual in each of the (up to) eight times over sixteen months that the individual is in the survey. The Current Population Survey is the primary source of data for information about labor force participation in the United States. It is also one of the most widely used data resources in social and economic research due to the breadth of topics covered in the survey including, employment, poverty, health insurance, food security, and voting. IPUMS CPS has been delivered by IPUMS for over a decade. The recent growth of the IPUMS CPS database has coincided with an explosion in use, by both old and new users. Over the past five years, IPUMS CPS has been the fastest growing component of the IPUMS. The MPC dramatically expanded the IPUMS CPS data series to encompass over 500 U.S. surveys taken over a 52-year period. With the addition of the new variable, IPUMS-CPS addresses the three main barriers to making full use of the CPS data as a longitudinal resource. First, linking records across data files without CPSIDP is technically difficult for several reasons. The 4-8-4 design the CPS survey—where households are in the survey for four months, out for eight, and back in the survey for four—limits the portion of the sample that could be linked in adjacent months and in consecutive years. 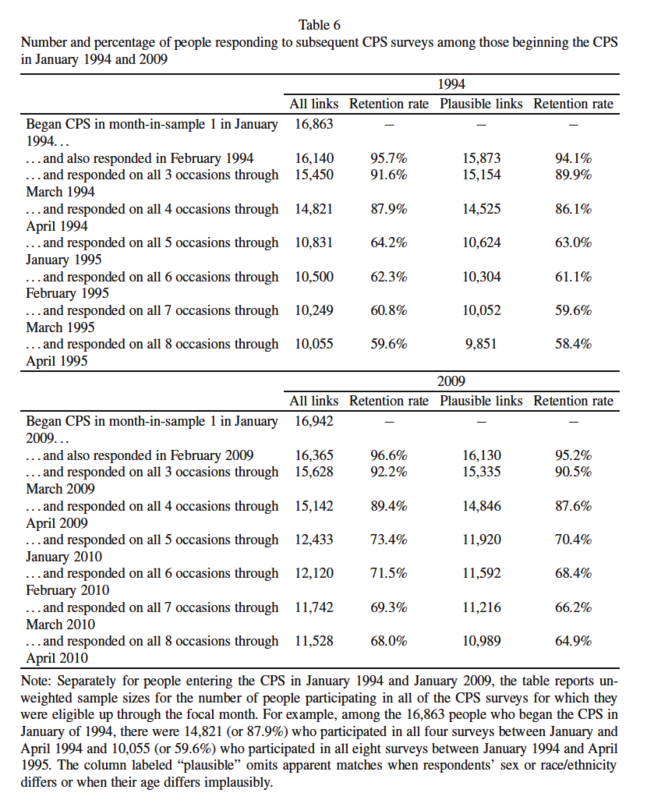 For several years of CPS data, the serial numbers (which constitute the most obvious basis for record linkage) are not unique across households. Changes in the composition of the household due to migration and mortality (along with non-response and data recording errors) further complicate linking. Second, navigating the maze of CPS documentation—even to determine the feasibility of a CPS-based longitudinal study—is daunting for researchers. Third, there is a data integration barrier for researchers. Surveys are often incompatible across years, and even when questions and variables do not change, researchers are hesitant to work with multiple files and codebooks. CPSIDP means that researchers will no longer face these barriers to longitudinal analyses. Linked CPS data open up new research opportunities for analysis over time. For example, research on the predictors and consequences of family transitions will be transformed by IPUMS CPS. The CPS sample is large, so any 16-month observation window includes substantial numbers of childbirths, marriages, divorces, separations, cohabitations, and widowhoods. The table below from our recent paper shows that approximately 10,000 individuals per month are observed eight times over the 16-month period. This facilitates cutting-edge work on such areas as the impact of labor market disruption on marital transitions, and the implications of marital dissolution for economic well-being. Because entire households are observed, researchers can consider the dynamics of the household at the level of individual, couple, or family. Another key opportunity for researchers is the analysis of trends in employment dynamics. Although the CPS has long been America’s main source of data for computing federal labor force statistics, its longitudinal design has rarely been exploited by researchers to model income or labor force dynamics. IPUMS CPS’s linked, harmonized data will soon be a primary source of information about employment and labor force dynamics. CPS will be even more powerful as a longitudinal resource once the Annual Social and Economic Supplement (ASEC) is combined with other months of CPS data. The ASEC is arguably the most popular of all CPS data. A recent working paper from MPC staff and members outlined the barriers researchers encounter along with the technical steps the staff behind IPUMS-CPS has taken to make CPSIDP available on the ASEC. CPSIDP will be available on the ASEC later this year.